Through this book, I have tried to create awareness about various aspects related to the concept of exalted planets in Vedic Astrology. 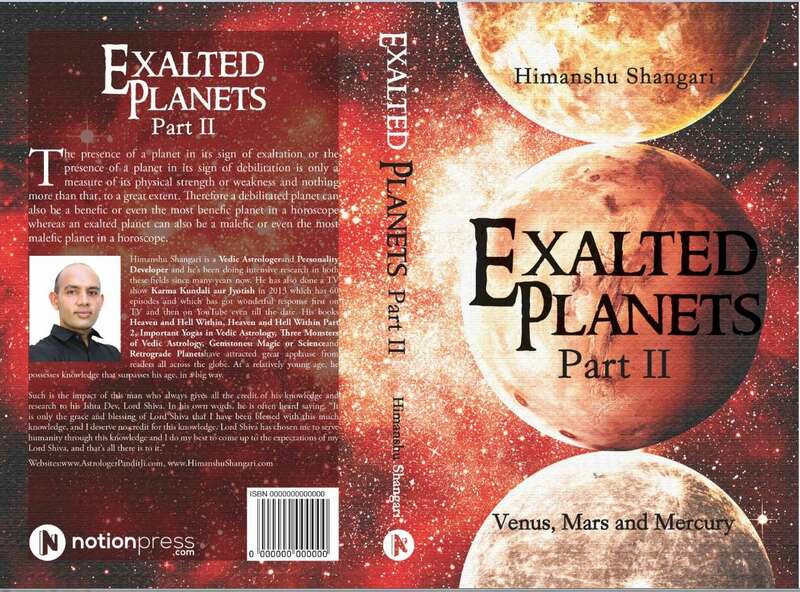 This book starts with an article on exalted and debilitated planets, which discusses some of the prevailing beliefs related to these planets and which also deals with some interesting facts related to these planets. Many astrologers believe that if a planet is exalted in a horoscope, it will always give benefic results to the native, which means that an exalted planet is always a benefic planet in a horoscope. The same astrologers believe that if a planet is debilitated in a horoscope, it will always give bad results to the native, which means that a debilitated planet always behaves as a malefic planet in a horoscope. Over a period of many years, so many good things have been said about exalted planets and so many bad things have been said about debilitated planets, that a majority of people interested in astrology have fixed their opinions about these planets. These people consider an exalted planet as a blessing in a horoscope and they consider a debilitated planet a curse in a horoscope. However, the placement of a planet in its sign of exaltation only indicates that the planet is very strong and the results produced by this planet are going to be significant ones. But those results may be significantly positive or significantly negative depending on the nature of such exalted planet in a horoscope. For example, exalted and positive Saturn is capable of producing strong positive results regarding the significances ruled by it, regarding the house it is placed in and regarding the planets and houses it aspects. On the other hand, there is almost no planet in a horoscope which may be as destructive as negative and exalted Saturn. Malefic Saturn placed in Libra can be destructive, very destructive or extremely destructive and it can completely destroy the significances of the houses and planets under the effect of its placement or aspects. Hence the presence of a planet in its sign of exaltation or the presence of a planet in its sign of debilitation is only a measure of its physical strength or weakness and nothing more than that, to a great extent. Therefore a debilitated planet can also be a benefic or even the most benefic planet in a horoscope whereas an exalted planet can also be a malefic or even the most malefic planet in a horoscope. The placement of a planet in a particular sign is not a measure of its working nature and it is more a measure of its physical strength or its style of working in a horoscope. Vedic astrology lays many important guidelines for deciding the working nature of a planet in a horoscope and those guidelines should be used to decide the working nature of a planet in a horoscope. It should be understood that even a debilitated planet can form some of the best yogas in a horoscope if it is benefic in that horoscope. On the other hand, an exalted planet can cause some of the worst types of problems to the native under its impact, if it is working negatively in his horoscope. 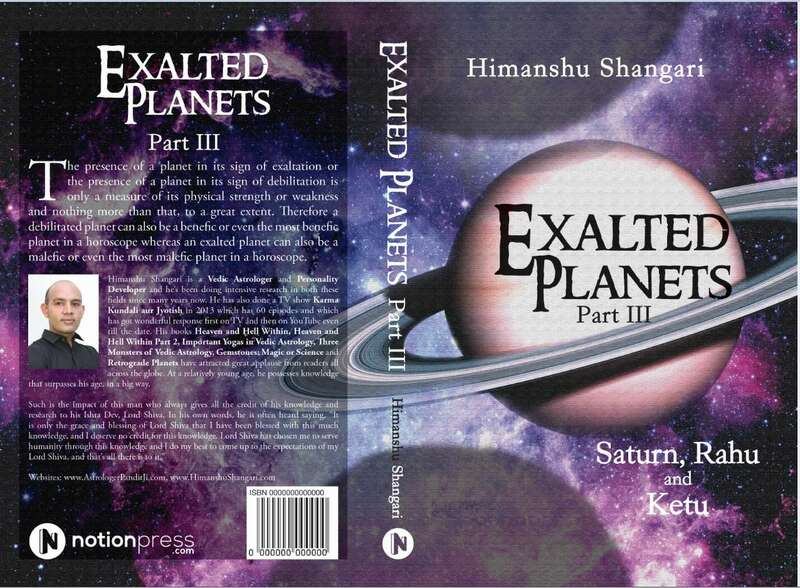 This book will be completed in three parts where the first part will cover exalted Sun, exalted Moon and exalted Jupiter; second part will cover exalted Venus, exalted Mars and exalted Mercury; and the third part will cover exalted Saturn, exalted Rahu and exalted Ketu.